The cherry blossom is perhaps the most important cultural symbol in Japanese culture, representing the evanescence of life and the sheer beauty of nature. It was this heritage which inspired us when creating our Cherry Blossom Tonic. Our new drink is a “hanami“ – a flower viewing – in a glass, bringing together centuries of ancient customs with the fondness of experimenting of innovative bartenders. 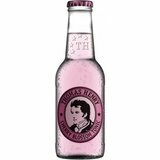 Its smooth and floral notes make it so unique that it deserves the Thomas Henry label. And it looks just as beautiful as the blaze of colour of the cherry blossom season. Cherry blossom season is a very special time of year, not only in Japan. The blossom’s vivid colours herald the start of spring, while the days are getting longer and warmer. Thomas Henry Cherry Blossom Tonic seizes this unique natural spectacle. The gentle bitterness of our Tonic Water meets the floral fruitiness of the cherry. It tastes great on its own and is a great companion for a choice gin or vodka. Following the Elderflower Tonic this is our second flavoured Tonic. Spring is here to stay. Oishii! That is Japanese for “very tasty“.